Blessing is a simple word, but yesterday night (Monday) just before sleeping I was thinking about the same again and again. Wished for a gadget to record my thought as I was too tired to use any keyboard or voice recorder. At times we wonder and sometime make fun of those award ceremonies where people on the stage keep on thanking people around him or her and sometimes even their dogs. I always love to read the preface of a book where authors thank about their loved ones and early critics and business partners. Webby Award (considered as Oscar of Internet) being techie kept it simple --- as they have "5 word Acceptance Speeches” rule. Well I was not thinking about those awards and long speeches but more about the people around me who are allowing me to cherish my daily life on my own way. After a horrible finish in Bangalore TCS 10K(1hr plus) and Chennai Half Marathon(2:27 my watch/2:09 race web site). 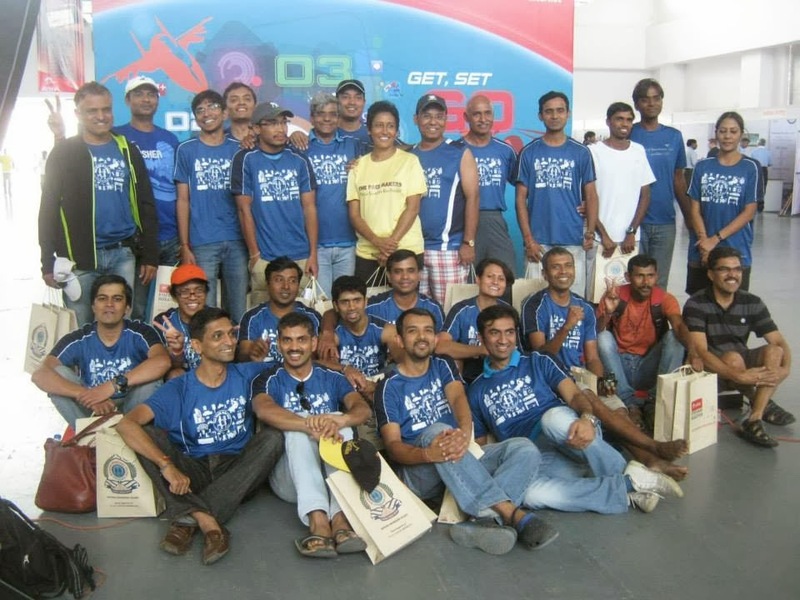 I was determined to be regular with Coach Kothandapani K C and Pacemakers group. 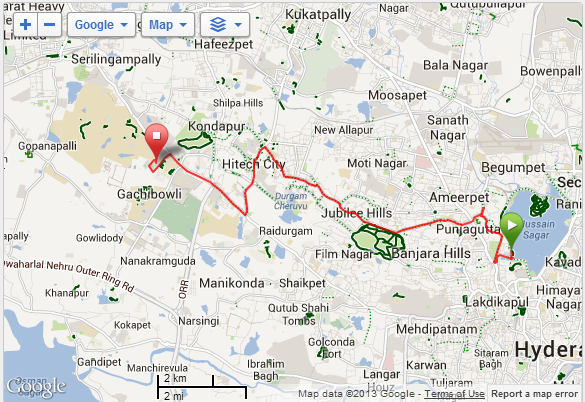 Earlier, was just running once a week with the group on weekend for long run and that too bit irregular. Now for one month started to leave home at 4:30 AM to reach Kanteerava Stadium for Tuesday and Thursday training. Tuesday, is interval training something I never ever tired before when I started to run, in early 2000. I struggled for weeks but eventually saw some improvement in me but there is still a lot to go. Thursdays we do tempo or core strengthening exercise which really helps running as core is the power house of our body. 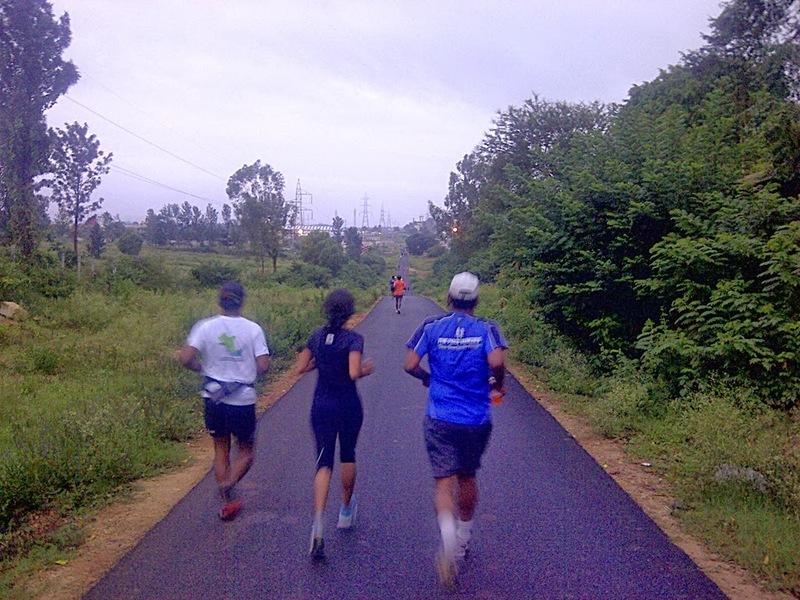 And couple of Nandi hill runs on the weekend ensured we were not scared of those flyovers in upcoming Airtel Hyderabad Half Marathon . In recent time, asked my younger brother to ship a pair of running shoes (4E-wide feet) & Garmin(GPS Watch). These items were personally carried to Bangalore by friends and colleague from US. These items are not easily available in India and if they are, they cost an arm and leg. Can not thank enough Pamela for being there like a rock. Now a days, Pamela rushes faster than Bolt on those 2 days as she prepares breakfast, lunch box and ensures Aarush and herself is ready with shower, breakfast and out of home by 07:30 to be at school on time. Also, in recent time lucky to have family members around who baby-seated Aarush on Saturdays as we are now running on Saturdays for long run instead of Sundays. 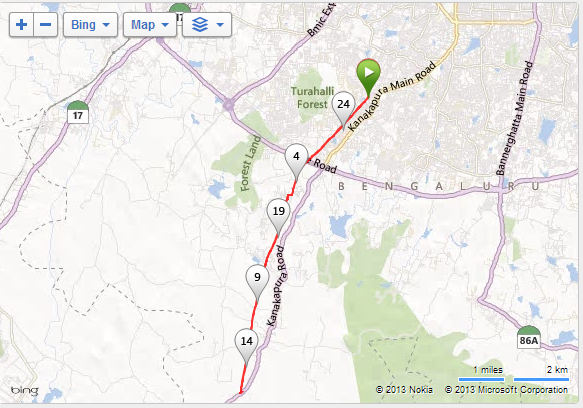 The result just speak for itself, finished Hyderabad Half Marathon strong with 2:01:33 on my Garmin. It is my best in recent time and I am happy with the split timing for each Kilometers. I was consistent throughout and had only few kilometers where I ran slower than pace 6. The last KM I was able to push myself and was around 5:10 pace again ; where crossed a fellow runner from the running group and felt like winning the Gold medal. Yes, there was hard work, determination, strategy which helped me to achieve this. A minute shorter would have been a icing on the cake. But again, all these could not have been possible without these people and their belief in me; so feeling really blessed. 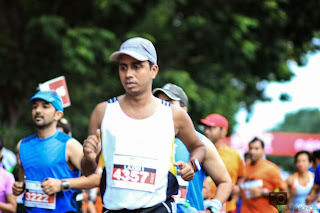 The race was an amazing one, met few finest Indian runners from other cities. The arrangement of transport, train tickets, hotel arrangement was too good; again special thanks to Coach and pacemakers team for that. The post-run lunch was something which I am going to drool and talk about for months to come. It was a unmarked restaurant named "Dine Hill", we were bit hesitant initially but once went inside for food; seeing the people and their plates we got a big cultural shock. 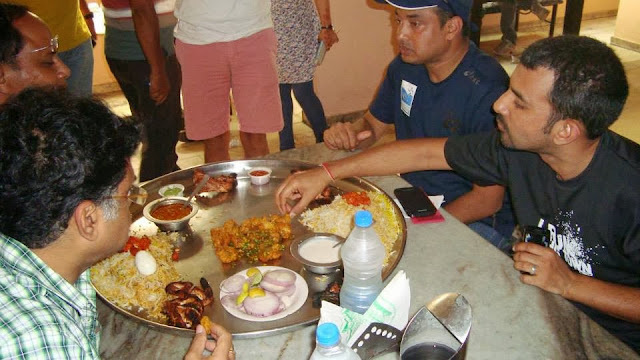 There were those huge dishes which are as big as the size of the table and 4-5 people eat together from the same plate. We asked the restaurant guy if he is going to give us separate plate; He said YES but added why do not you try this way of sharing and eating food with friends - love grows between friends. There was a discussion in the running group to practice hill-run before upcoming Hyderabad run which I am trying to be a regular member. Normally the "numero uno" destination for hill training around Bangalore is Nandi Hill ; which is 60KM north of the city. 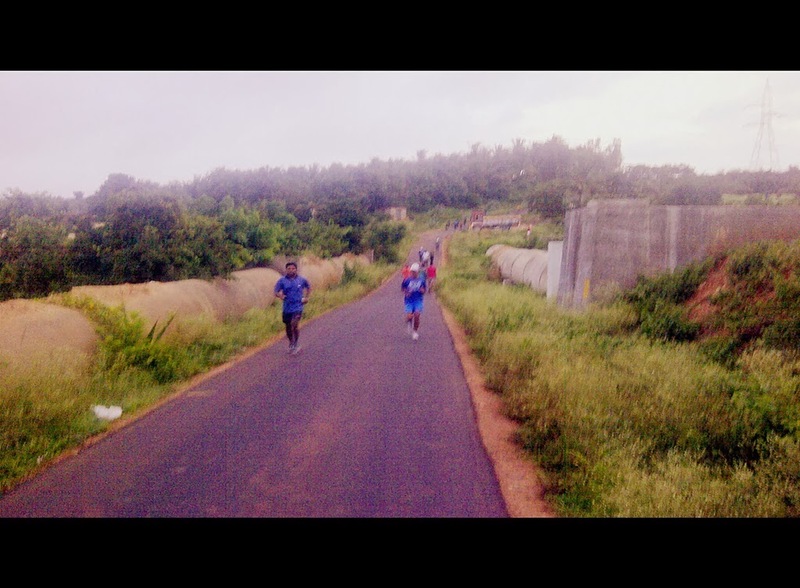 Have already run Nandi hills few times and yes Nandi is grueling specially the last 3 KM. Nandi run is 15KM in total where you go 7.5 KM up and come down the same. But the run does not duplicate Hyderabad where we need to cross 3 flyovers. Pipe-line road at south of Bangalore parallel to Kanakpura Road is very similar to Hyderabad . 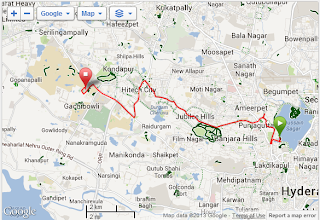 The initial plan was to run 21 KM one way and had a sumptuous breakfast at one farm house.